The noted English political philosopher A. P. D'Entreves argued that "it is hardly possible for the modern man to accept the system which St. Thomas founded...without renouncing the notion of civil and religious liberty which we have some right to consider the most precious conquest of the West." 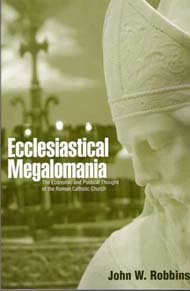 Ecclesiastical Megalomania explains the conflict between Roman Catholicism and freedom in detail, relying on official Vatican pronouncements to demonstrate that Roman Catholicism is hostile to constitutional government, political and economic freedom, and the private property order. The "Mother Church" is the mother of feudalism, the corporative state, liberation theology, the welfare state, and fascism. Contents: Part 1: Envy Exalted. Private Property; The Universal Destination of Goods; Rerum Novarum: On the Condition of the Working Classes; Subsequent Encyclicals; Feudalism and Corporativism; Liberation Theology; The Redistributive State and Interventionism; Has the Pope Beatified Ayn Rand? Lord Acton on Roman Catholic Political Thought; Roman Catholic Political Theory; The Political Thought of Thomas Aquinas; Persecution, Inquisition, and Slavery; The Nineteenth Century; The Magisterium; Solidarity, Subsidiarity, and the Common Good; Fascism and Nazism; Totalitarianism; Strategy for Subverting a Republic; World Government; 2000: Jubilee, Punctuated by Apologies.